Well, it looks like I can't pull the wool over your eyes! I'm something of a cake bartender, specializing in cocktails cakes and cupcakes designed to taste like the real thing -- with high-quality liquors and liqueurs infused throughout. My favorite part of the process? Making the cakes and cupcakes look like the cocktail inspirations behind them. Kristine gave me the chance to do just that when she requested my very first batch of margarita cupcakes. 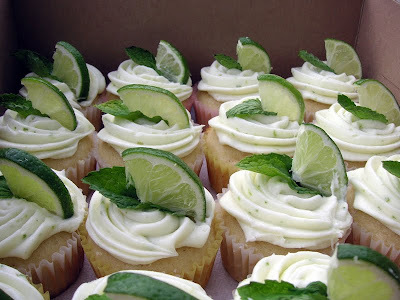 When she put in a request for a batch of mojito cupcakes to celebrate her friend Aaron's birthday, I simply couldn't wait. 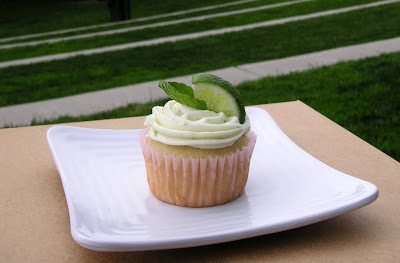 My assistant had a ball whipping these up, crushing fresh mint leaves with a mortar and pestle and zesting limes for the frosting and filling. 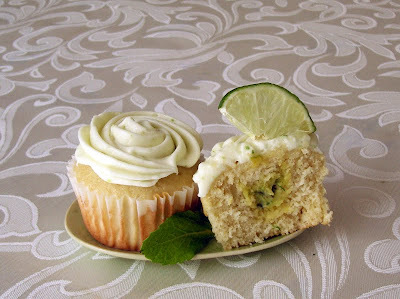 These rum-infused cupcakes were filled with a mojito custard (flavored with lime juice and crushed mint), frosted with a refreshing lime cream cheese frosting (see all those little green specks of lime zest? ), and topped with a fresh mint leaf and lime wedge. As refreshing as a cool cocktail on a hot summer day. And here's a look at the filling inside that truly captures the refreshing lime flavor and minty goodness of a classic mojito. Thanks, Kristine, for the opportunity to craft a new cocktail cupcake. And happy birthday, Aaron! I hope you enjoyed devouring these as much as my assistant and I enjoyed playing bartender.